Small yet sweet, the Garden Room is perfect for those traveling on a budget or looking for an inexpensive yet special Seattle Tacoma weekend getaway treat. 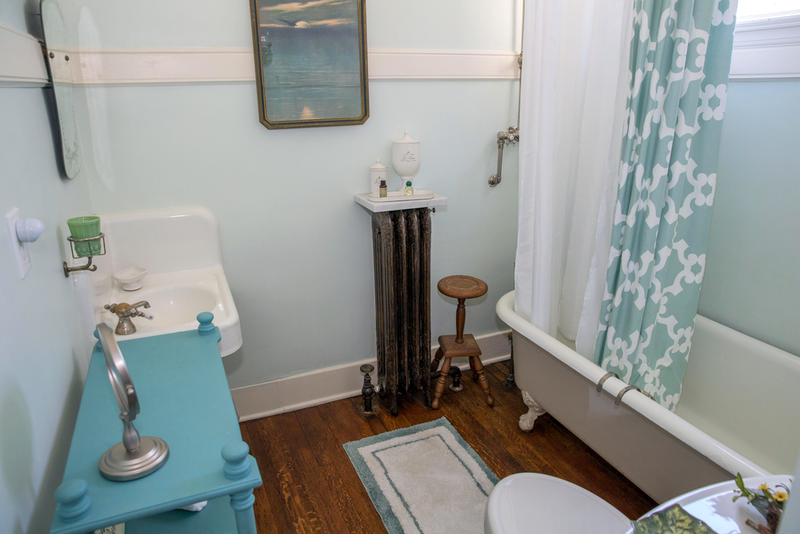 The Garden Room consists of a 10′ x 12′ bedroom and the original bath to the mansion, with an antique clawfoot soaking tub and Victorian rainshower. 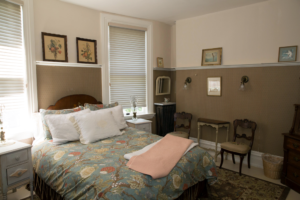 For those who plan to be out and about most of the time or spending their relaxation time on the wraparound porch or in front of the fire in the downstairs parlor, the Garden Room is a great way to experience Victorian opulence while leaving much in the wallet for an evening’s meal and a glass of wine. Two large western-facing windows in the bedroom, another large window in the bath and 9 1/2′ high ceilings throughout give a feeling of airiness and space – lots of light. On the 2nd floor of the mansion, the Garden Room overlooks the side garden, with a large Japanese maple tree just outside. 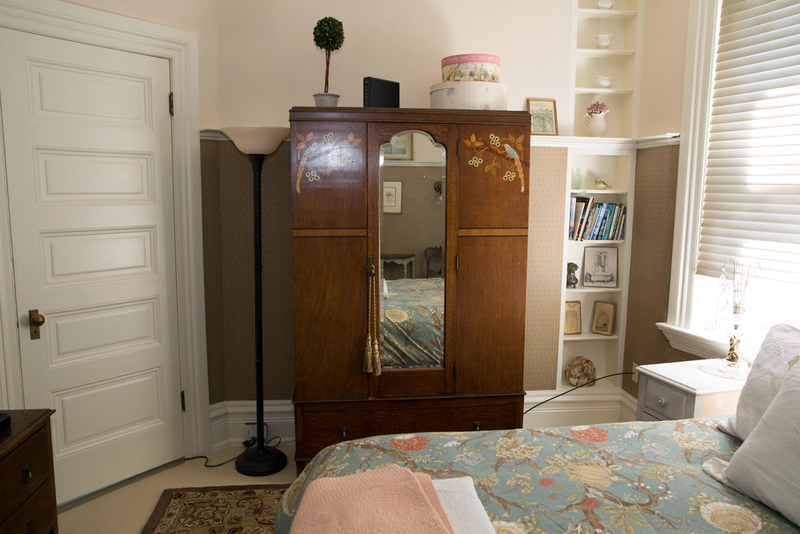 The queen bed, dresser and armoire are a 1920’s vintage mother-of-pearl bedroom set brought over from England. The bookshelves are filled with vintage reads and fun regional texts, such as a book identifying bird eggs and another on woodland fairies. 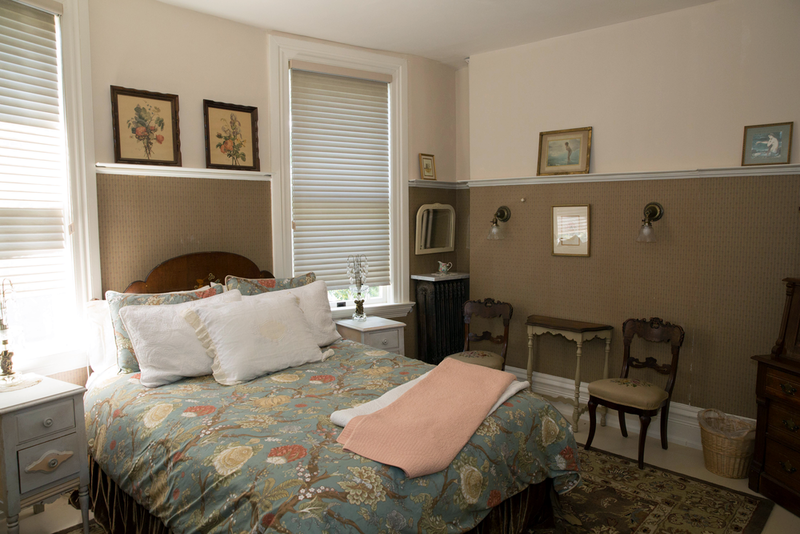 Originally the children’s room, plate rail which once held children’s books and toys now houses a collection of local vintage theater photos and art. The editor at Travel & Leisure said when touring Chinaberry Hill that you can tell much about an establishment by looking at its smallest, simplest accommodation–apparently the less expensive rooms are often over-looked and corners are cut when it comes to decor and ambiance of the more economic rooms. She said it was clear that we took the same care in creating wonderful spaces in the Garden Room and Hayloft Suite that we did in our larger multi-room grand suites. She also pointed out that we had clearly put as much into our rooms, both dollar and emotional impact-wise that we had invested into our “lobby” and common guest areas – another sign of hospitality excellence we are told. Of course, we didn’t even consider doing it any other way, but it was fun to learn about travel writers’ tips and secrets when separating out clear winners from the wannabes. Yes, the Garden Room has a small view of the bay. No, it is not anything like the view from the Pantages Suite or wraparound porch – or even the Rose Room. Still, if you’re like us, it’s fun to look out at a distant stretch of blue and know you are that close to the water and nature and all that the Pacific Northwest has to offer. And then you think about Starbucks because the words “Pacific Northwest” conjures the image of Seattle and Seattle of course is inextricably linked to the mermaid sanctioned brew that had its modest start near Seattle’s working port. Well, mermaids and fishermen go hand in hand and you suddenly remember there’s a pretty good brew pub down on the waterfront with one of the best porters you’ve tasted in years, with definite chocolate and espresso overtones — and before you know it, you’ve got your jacket on and you’re heading down the stairs two at a time, feeling a lot younger than you did just moments ago. Many return guests have made the Garden Room their Pacific Northwest abode year after year (some from as far away as England) – the room journal leaves a rich trail of such sojourners. So don’t be afraid to save a little travel money and luxuriate in the lightness of spirit that smallness has to offer.